Explore one of India's most memorable, fascinating and breathtaking archaeological sites during this rewarding India Tour, allowing you the chance to absorb the historic tales of this UNESCO World Heritage Site. Leaving early in the morning, you will be privately transferred by road to Hampi. The journey takes around seven and a half hours driving through the mountainous Western Ghats and on towards the Deccan Plateau. There will be a chance to stop for a drink and something to eat along the way. By mid-afternoon you will arrive in the UNESCO World Heritage Site of Hampi where you will spend the afternoon exploring the ruins. 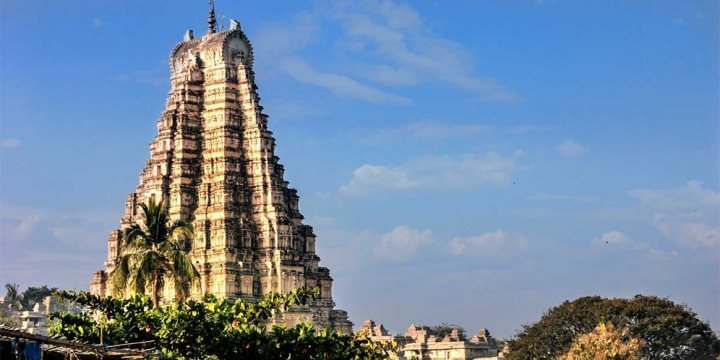 Highlights include visiting the grandest of Hampi’s religious monuments, the Vittala Temple and the imposing Virupaksha Temple, one of India’s oldest functioning temples. In the early evening, you will drive to the nearby town of Hospet where you will check into the Krishna Palace Hotel and spend the night. Leaving early the next morning, you will spend the day with your guide discovering some of Hampi’s most famous ruins. Explore the impressive Royal Enclosure, with its expansive halls, elegantly carved stone plinths and pillared shrines before driving to the iconic Lotus Temple and the impressive Elephant Stables. After watching the sunset from one of the elevated viewing points, you will be transferred back to Hospet for your second night at the Krishna Palace Hotel. After breakfast on the final morning, you will check out of the hotel and drive back to Goa. There will be a chance to stop for a drink and something to eat along the way. You will be able to book this excursion either in the UK or on arrival / during your holiday to Goa.